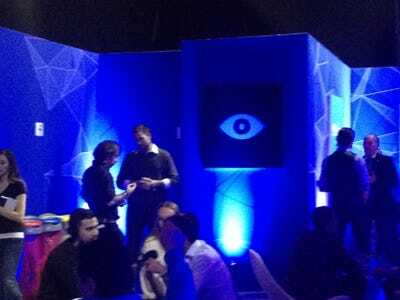 Robin Wauters stumbled out of a small room at Dublin’s Web Summit. 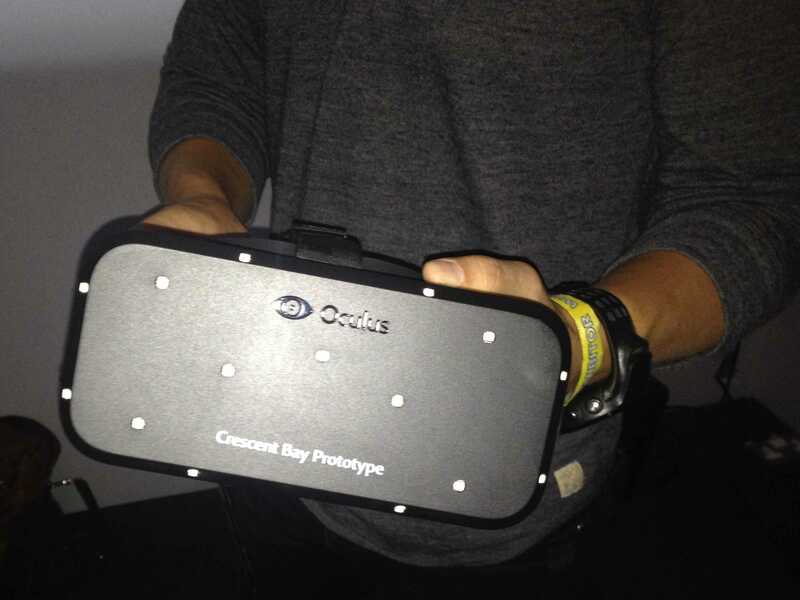 He had just experienced Oculus’ latest virtual-reality prototype, Crescent Bay. Wauters, a former TechCrunch reporter, had tried on Oculus years ago. This version, he said, yielded a crisper image and a more convincing virtual world. A long-time Oculus employee, Joe Chen, told Wauters his reaction was common. He joked that there needed to be a second “decompression” room, where people could sit and reel after they wear the device. Oculus Crescent Bay isn’t available for purchase yet. It’s made of 3D printed parts that are currently impossible to mass produce, which means building one is extremely expensive. When asked how expensive, Chen declined to say. Robert Scoble, a tech influencer who’s known for his gadget reviews, was sitting beside me when Wauters emerged. In true Scoble fashion, a pair of new $US300 headphones were wrapped around his neck. I tried them on — they felt like subwoofers strapped to my ears. Each beat gently shook my head. “Do you think Oculus is the future of computing, like Mark Zuckerberg does?” I asked him. It could be, Scoble thought. He believed it could become a big gaming platform that could also change the way movies are shot and directed. Right now, movies are made for watching, not participating, Scoble explained. Oculus turns every onlooker into a fully-immersed character. Scoble also thought Oculus could be a strong platform for education and tutorials. Imagine needing to fix your car, putting on Oculus, and visiting a virtual mechanic who shows you how to repair a virtual model. It’d be like diving into a YouTube video and feeling so absorbed in the experience you could reach out, touch it and interact with it. But could Oculus, a clunky headset that Velcros to your head like a bike helmet, really be better than big-screen TVs and surround-sound movies? Or were Scoble and Wauters geeking out? Scoble was once so obsessed with Google Glass, he wore it in the shower. I needed to try it. I signed up on a long wait list to get a 15 minute demo of Crescent Bay. Soon, Chen waved me in. He led me behind a hidden wall marked by Oculus’ logo. Inside, there was a a dimly lit room with a large tripod and a mounted TV. A squishy, 4×4 mat laid in the room’s center. Chen ushered me onto it and told me not to step outside its boundaries. “We don’t want you accidentally walking into the wall during the demo,” he said. He was serious. Business InsiderThis screen on the TV became 3D and surrounded my whole line of vision the second I put on the goggles. As he strapped the device to my head, I felt nervous. One Web Summit goer said he had felt vertigo during the demo because he almost walked off a virtual cliff. This person said he had to flap his arms backwards to regain balance. Chen assured me I’d be fine. He tightened one more strap, and my eyes were cloaked in total darkness. When I looked down at my nose, I could see a small glow of the outside world I’d left behind. My nose is small, and Oculus is built for “all types of noggins,” Chen said. Soon, rows of small, silver globes filled my line of vision. I spun around and found the circles surrounded me on all sides, up and down, left and right. The word “Oculus” appeared in front of me. The simulation was about to begin. Suddenly, I was standing in an empty submarine. It looked pretty real, like a movie with such strong visual effects, you almost forget a computer made them. Instead of a squishy mat, I was now standing on metal. To my left there were levers and buttons. A chain dangled in front of me. I stretched out my hand to grab it, but no arm appeared in my line of vision. I was a floating, armless thing that could sense the Oculus-created world, but not interact with it. Chen began narrating the scene for me, letting me know what to expect. I was wearing headphones but his voice over-powered the sound effects and acted like a voice of God. 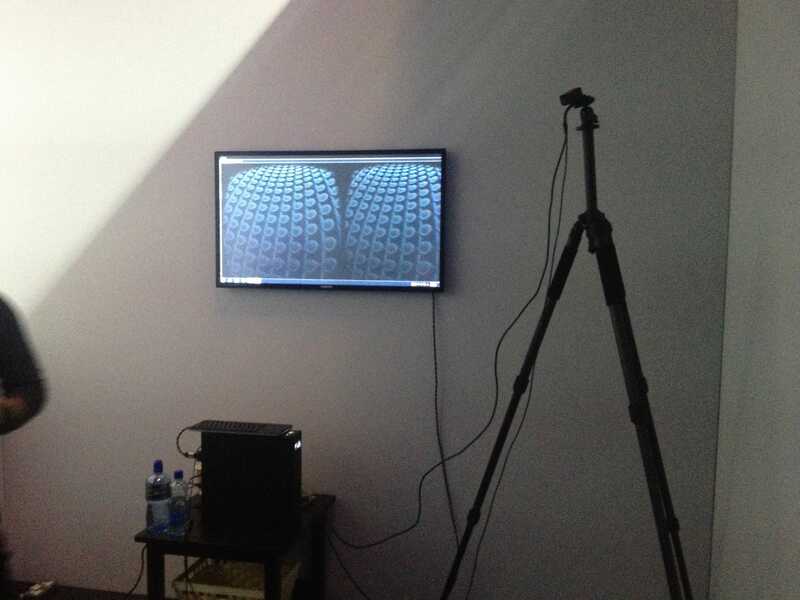 Soon, the room changed and Oculus brought me face to face with a small Tyrannosaurus Rex. Through my headphones, I could hear the dinosaur growling. It seemed ready to pounce. After my encounter with a dinosaur, Oculus introduced me to cuter, cartoon animals (a fox, a bear and a rabbit) which surrounded a campfire. Square-shaped smoke emerging from the flames. A tall tree stood against my back. Another scene put me on a moon-like planet where I encountered an alien. The alien spoke gibberish to me and waved. His eyes followed me as a moved left, right and squatted down. Chen said this world took a 5-person team just one or two months to create. Oculus whisked me off to another room and I found myself staring in a mirror. Instead of my face, there was a floating white mask that mimicked every nod and turn of my actual head. Behind me a table was set for tea. Again I wanted to reach out and grab a glass, but no hand appeared. 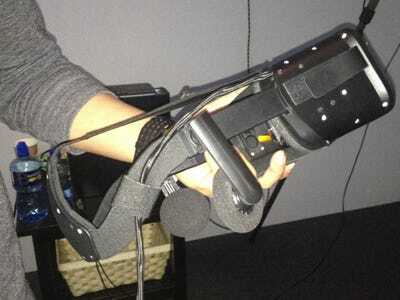 Chen says the Oculus team is working on a solution to the armlessness. Oculus felt most real when I was transported to a high platform in the middle of a city. To my left and right were handrails, but of course I was unable to grab them. I inched forward and peered over the virtual ledge. If I went to far, it seemed I’d plummet to my death. My legs became shaky and my heart rate quickened. “What happens if I fall?” I asked Chen. He joked that world would open up and swallow me. I didn’t have the guts to move forward and find out. I zipped to another world where a large T-rex was waiting. Chen told me it was the other T-Rex’s mum. The beast ran toward me and then trampled me. While beneath it I looked up and saw its tail whiz by. The final scene was created by animation company Unreal, and I felt like I was in a Michael Bay film. I was in the middle of a slow-motion street riot, where bullets shot past my face. Bazookas exploded into a nearby wall and debris came flying from the right. A car to my left blew up and twirled in the air above me. I could see a passenger still inside, and I watched the car land and explode in the distance. I could no longer hear Chen’s narration; the explosions were too loud. When the final scene ended, Chen helped me take off Crescent Bay. I tried to make sense of what I’d just experienced. I came out and found Scoble still testing out the headphones. “I have no words,” I told him. I’m not sure if Oculus will be the next big computing platform, like Mark Zuckerberg believes it will be. All I know is I experienced something that felt very cool, and it’s not an experience that words or pictures can replicate. Chen joined Oculus two years ago as one of its first employees. 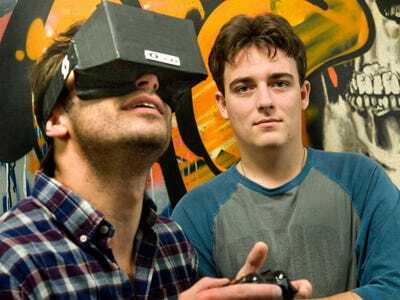 He was recruited by its founder, Palmer Luckey, who was then 19. Then, Oculus was barely functioning; Chen says the product was held together with duct tape and paper.